Vladimir Grigorievich Shukhov was one of the greatest structural engineers of the early Twentieth Century and unquestionably the leading engineer of his era in Russia. He pioneered the use of entirely new structural systems, creating hyperboloid structures of double curvature whose lightness and geometric complexify defy the imagination, even in the computer age. The Shabolovka Radio Tower of 1919-1922 is his masterwork. It is a structure of dazzling brilliance and great historic importance. Commissioned on the direct orders of Lenin, it was the first landmark structure of the Soviet period, soaring 150 metres into the air to command the Moscow skyline. In its day, the filigree lattice structure was a pure expression of technical progress — a symbol of faith in the coming age. Today, however, it is neglected and decaying. Without urgent attention it will doubtless fail. The most immediate steps should be to commission an expert appraisal of its condition and devise a plan for its faithful restoration. 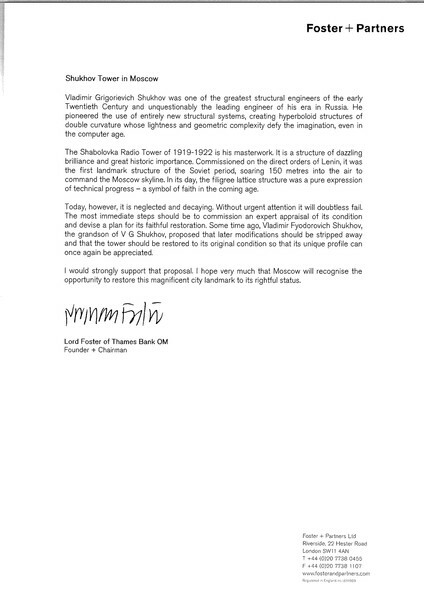 Some time ago, Vladimir Fyodorovich Shukhov, the grandson of V. G. Shukhov, proposed that later modifications should be stripped away and that the tower should be restored to its original condition so that its unique profile can once again be appreciated. I would strongly support that proposal. I hope very much that Moscow will recognise the opportunify to restore this magnificent city landmark to its rightful status.